As you may know, I have been taking part in the Aussie 'lighter life' challenge and this Saturday I attended a bootcamp day with some lovely Angels at the Reebok gym in Canary Wharf. I thought it would be a day of fun and games but, whilst I enjoyed the exercise we did, the yoga was more intense than I anticipated and 'Gymanda' certainly put us through our paces! 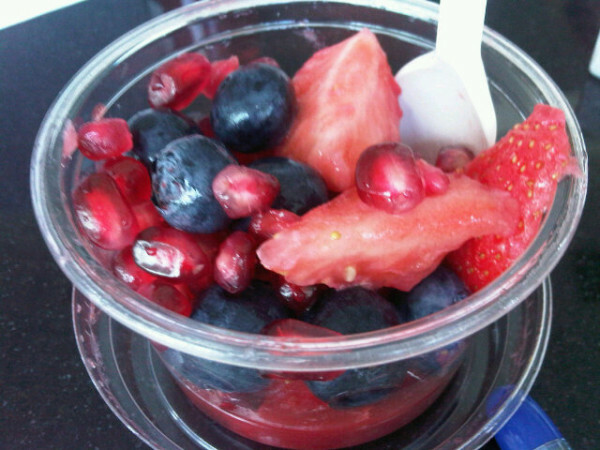 When I got there though, I tucked into a yummy breakfast of strawberries, blueberries and pomegranate. I have been trying to eat more healthily recently and my fridge has been stocked with fruit and veg rather than crisps and chocolate! So far the nutty one is my favourite but the original also deserves a mention! I am also indebted to the lovely Lil (who was also my exercise buddy on Saturday!) who introduced me to the infamous Hummingbird Bakery which completely negated any good done by the bootcamp day! I figure though, as long as I don't over indulge then I should stay on track for a lighter life this Spring! The wrapping was SO beautiful that I didn't want to open it! 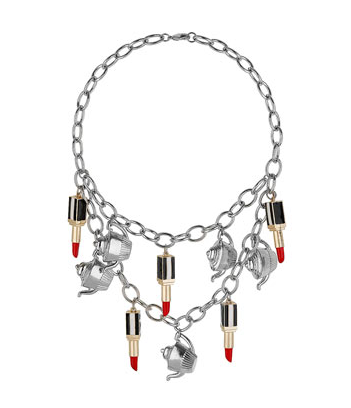 In an ideal world this Danielle Scutt necklace would definitely feature...a girl can but dream! I mean what could be better than teapots and red lipstick?! I also LOVE this teapot ring... jewellery perfection! I forgot to add that this is an EPIC hot chocolate with Malteasers, fudge sprinkles, marshmallows, whipped cream... it's basically heaven in a mug! What have you done to cheer yourself up this week? Have you done any window shopping recently? The bootcamp was so much fun! I'm eating slightly healtheir now as well. And those cupcakes look delicious!! Hope you had a great time tho. I love Humming Birds - in fact I was only introduced to them about 2 weeks ago. They do wheat and gluten free cakes so anyone that has allergies like me are usually catered for. I've tried Bar 9 - found the seeds and nuts too overwhelming for me, I personally didn't like them. But they are a very healthy alternative. I kind of love 9 bars. I wish I was as healthy. I often buy these kind of bars thinking i'll turn a new leaf in my diet book! I really want to try the 9 bars, but I hate nuts in bars or chocolately things. For some reason, despite loving nuts the very idea makes my skin crawl. 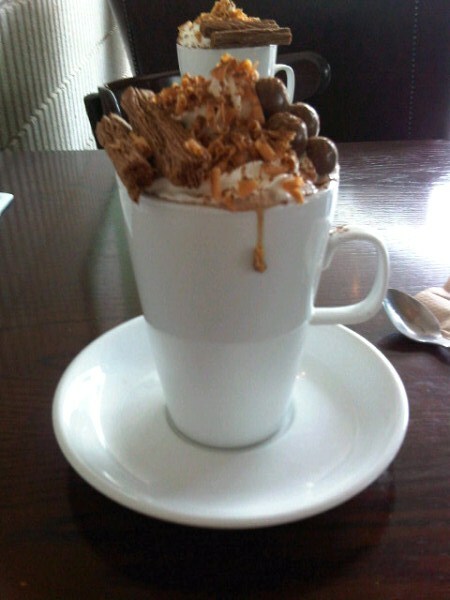 That hot chocolate, I'm presuming, looks so beyond amazing that I'm fighting the urge to pop into town for a hot drink! I don't think there's a single thing (except the stress and illness- obviously). The hot chocolate looks beyongd epic, and hard work exercise can be good- love the feeling afterward. I swim pretty much every day and although I often get half way through the time I set myself and start to look longingly at the jacuzzi, I love getting in the hot showers feeling a bit knackered knowing I worked my backside off. Try not to stress too much, it'll be over before you know it and you can only do so much- take this from someone who's 6 in with 2 more to go. It WILL be fine. Sorry about the 'down' parts of your week. I hope you are feeling better soon. Maybe try doing a bit more yoga to de-stress - or at least distract! Good luck with your finals my dear! As for the skirt, maybe try a spot of colour blocking? Wear a really contrasting shirt with it?? Glad I could bring the lovely Hummingbird into your life. Was nice to catch up too. Good luck with the dreaded exams. Hang on in there, you'll be there soon. i'm so very glad you like your parcel and skirt maria, sorry it tok me so long to get it to you! i think the midi would suit you high waisted cinched in with a belt, your new tabio socks, heels and either a black shirt or a loose fitted white/grey vest. that hot chocolate looks ridiulously amazing!